December in Rocky Mountain National Park can play host to some of the most beautiful and dramatic sunrises Rocky see's all year. It's also a month that great sunrises are accompanied often with the howling winds that Rocky Mountain National Park is famous for. If you can manage to survive the winds ripping off the mountain tops, you may be able to see some of Rocky Mountain National Park's most iconic landscapes bathed in beautiful light. 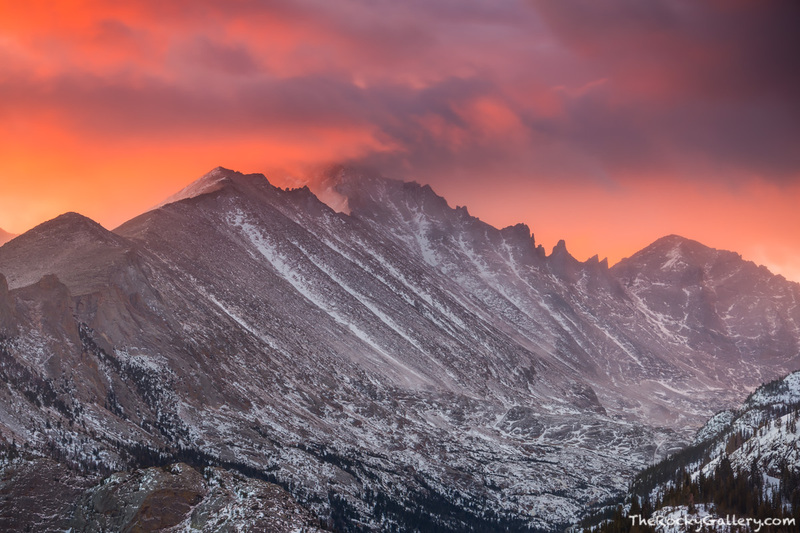 This December morning as the winds roared across Glacier Gorge, Longs Peak and it's backside known rightfully so as The Keyboard of The Winds, clouds over the summit exploded with dramatic color as sunrise filled the skies over Longs Peak with brilliant reds. Photo © copyright by Thomas Mangan.